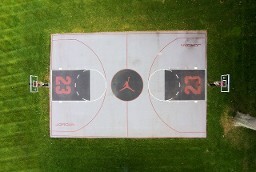 The gradual wear of an outdoor basketball court can eventually result in hazardous conditions. 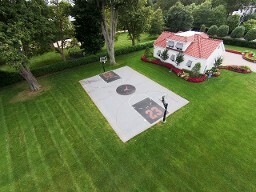 Supreme Kourts® recommend that your outdoor basketball court should be professionally resurfaced every 4-5 years. Supreme Kourts® resurfaces many asphalt and concrete outdoor basketball courts each year. Our team of professionally trained and experienced color-coating specialists who can bring your court back to “like-new” condition. We can also replace or repair your existing basketball standard (post, backboard, etc.). • Pressure clean and power blow basketball court to remove loose dirt, mildew and oil. • Apply 1-2 coats of acrylic resurfacing material over entire court area to fill minor depressions, voids, and imperfections. • Apply 1-2 coats of acrylic color concentrate to provide color over court surface. • Locate, mark, and paint two-inch wide playing lines in accordance with High School regulations using white textured heavy bodies acrylic latex paint. Supreme Kourts® turn-key court installation assurance programs reduce both costs and worry over unplanning problems plus coordination with all vendors.